Circle of Blue reporter Brett Walton says that drought is forcing the public to confront important questions about the value of water. 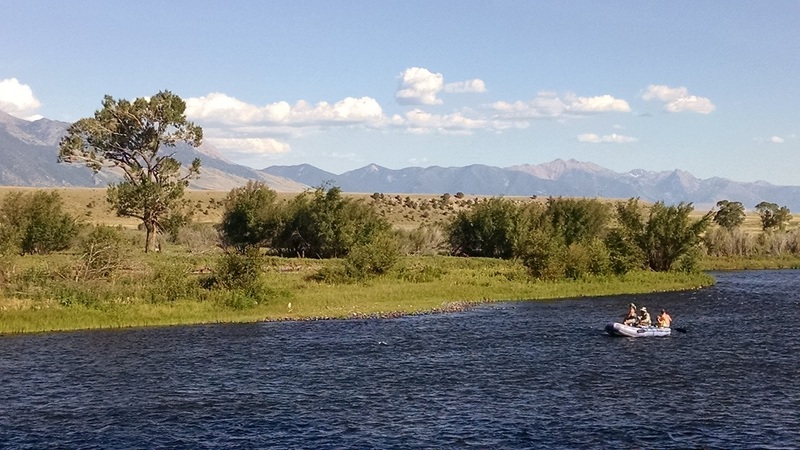 Drift boats carry fly fishermen down the Madison River, in southwestern Montana. Click image to enlarge. ENNIS, Montana — As roads go, the shoulder of Route 249, which flanks the broad bottomlands of the Madison River, is an inspiring path for a run. On a recent evening in late July, the route was particularly splendid. Golden-hour sunlight burnished the Madison Range with a honeyed glow, illuminating one of those Big Sky views that stirs wealthy urbanites to peruse ranch listings and learn horsemanship. I set off on a long out-and-back up the valley, but after 15 minutes I stopped running. It was not for lack of breath: sprinklers caught my eye. As the road doglegged, one of the great conflict zones for water use in the American West sprawled before me. Beyond, just out of sight, was the Madison River, where drift boats carried fly fishermen along some of the country’s best trout habitat. In the river’s floodplain were rows of alfalfa, one of the thirstiest field crops. The scene was nearly silent, interrupted only by the occasional songbird and the sprinklers, which swung left and right in a 180-degree arc, their swishes and tuts sounding like a roomful of typists reproducing an endless novel. Agriculture and rivers. These are two of the chief contestants on the West’s water stage. Farming, which uses, on average, at least 80 percent of the water that humans pull out of streams and aquifers, has slayed many a river. Irrigators on the Gallatin River, a neighbor to the Madison, for instance, have the legal right to dry up the waterway, according to Peter Brown of the Gallatin Valley Land Trust. I spoke with Brown at the end of July during the Western Media Summit, a forum hosted by the Teddy Roosevelt Conservation Partnership, a hunting and fishing group, for discussing issues concerning natural resources and public policy. The focus this year was public lands and the recreation economy. Cities, mines, and power providers also compete for water and have damaged rivers. In the West today, much of the debate about water centers on its economic value. With a limited resource, how can society get the most bang for the liquid buck? What uses are most valuable? What is the proper balance? Withdrawing some water is useful. But taking too much is harmful. But the rights system can also be beneficial to rivers. It sets up a framework for trading water between farms, cities, and waterways. There are countless examples across the West of lease agreements, fallowing programs, and efficiency improvements that cut water use on the field, put money in a farmer’s pockets, and keep rivers alive. Douglas MacDougal, a partner with Marten Law, a firm specializing in environmental law, notes how some Oregon farm districts take value into account when allocating water in a drought. In Colorado, thanks to a 2013 law that began to chip away at use-it-or-lose-it, farmers and cities are developing new conservation agreements to boost rivers without endangering water rights. River advocates are increasingly using economic data to show that leaving water in the stream is not just an exercise in fish-hugging. There’s real money in it too. Wildlife recreation was a $US 1.4 billion economy in Montana in 2011, according to the National Survey of Fishing, Hunting, and Wildlife-Associated Recreation, a federal report published every five years. That includes dollars spent on licenses, gear, food, and lodging in the state, which produced $US 40 billion in economic output in 2011. The state’s alfalfa crop brought in $US 403 million in 2012, according to the U.S. Department of Agriculture. The wildlife recreation report is to say nothing of the value of commercial fisheries, rafting, and a home with a river view. As I ran back to the rental car, my thoughts meandered again: to the ridges east of Mt. Rainier, in Washington state. A week earlier I had competed in an 80-kilometer (50-mile) trail race, the White River ultramarathon. Before the race, I tweeted some words from Australian marathoner John Farrington, an elite runner who described so accurately the foreboding experience of endurance sports. How true, especially in these days of drought. Pain has value too. It lets us know when a limit — biological, physical, emotional — is approaching. Go far beyond that limit, and for too long, and the pain does become excruciating. Time to step out of the fire. Time to rethink water. The value of the California drought, painful as it is, is that the state’s citizens are beginning to ask the sorts of questions that might previously have been confined to a conference room. Who gets water? How much? Who decides? What is valuable – economically, socially, ecologically – about rebuilding a wetland, or planting an almond orchard, or watering a lawn? Can competing interests produce joint benefits? Drought brought these questions to the surface. The dry hot days hurt now — for the homeowners without running water, for the farmers who must fallow fields, and for the fishermen who see their catch disappearing — but the pain will be beneficial later. If the state pays heed. What changes in water management, small or large, have you seen because of the drought? What is working? What isn’t? Contact Brett Walton reach him on Twitter at @waltonwater, or add a comment below. Note: Teddy Roosevelt Conservation Partnership paid for my hotel and meals during the summit.